The T7.315 is one of two new heavy-duty models in New Holland’s T7 Series launched at the iconic farm machinery show in Hannover, Germany. New Holland says the T7.315 delivers versatility for performing a wide range of field and haulage jobs, from row crop work, baling hay or mowing to hauling manure and other big chores. "The new model also features the revolutionary IntelliCruise™ tractor-baler automation which enables New Holland’s BigBaler to control the tractor’s speed," says Agriculture Brand President Carlo Lambro. "IntelliCruise maximises productivity and bale consistency, making the T7.315 the ultimate baling tractor." The prestigious Machine of the Year 2016 award was conferred on New Holland among many other brands in a variety of categories at Agritechnica this week. 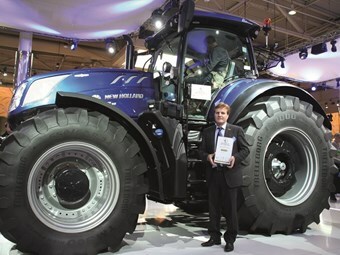 The brand new T7.315 tractor was bestowed the title in the L-category by a jury of 19 journalists representing leading European agricultural publications. Selection criteria focused on innovative features, performance, productivity, cost of operation, ease of use and operator comfort. "This award represents an important recognition from the industry of New Holland’s approach to product development that focuses innovation," Lambro says. "New Holland technologies enable our customers to run their farming businesses efficiently, profitably and sustainably. "We are particularly proud of receiving this award this year, when we are celebrating New Holland’s 120 years of innovation in agriculture," he says. New Holland Head of Tractor and Telehandler Product Management Sean Lennon adds the company devoted a lot of effort to developing this product: a tractor meeting the specific requests made by our customers. "We asked them what they wanted from their ‘ideal tractor’," he says. "They (the customers) told us they would like a top-of-the-range T7 with more power that would also be capable of high load jobs usually done by heavier tractors and of taking multi-tasking to a new level. "The T7.315 delivers on every point," he says. This award is a well-deserved recognition of the hard work and dedication of all those involved in the development of the T7.315, from our engineering teams to the whole Basildon plant team, who set up a brand new dedicated assembly line and new processes to ensure consistently high quality on every unit leaving the line." An electronically controlled variable geometry turbocharger delivers the torque required to operate at low engine speed and react quickly to load changes. The new T7 series models also feature New Holland’s award-winning Auto Command™ continuously variable transmission (CVT). A four speed rear PTO and a two speed front PTO allow the engine to be operated as efficiently as possible. The engine features New Holland’s ECOBlue™ Hi-eSCR (High-Efficiency Selective Catalytic Reduction) technology to meet Tier 4B emissions standards. The two new T7 models can mount larger group 48 and 49 tyres (2050mm and 2170mm diameters) with a rear tyre width up to 900mm. T7.315 automation features such as the latest generation Headland Turn Sequencing, IntelliSteer auto guidance and PLM™ Connect telematics, put the driver in full control of the tractor. These new models also feature New Holland’s revolutionary IntelliCruise™ tractor-baler automation that allows the New Holland BigBaler to control the tractor’s speed according to changes in the windrow to maximise productivity and bale consistency.